This is the second of three reviews for Gill of RealWeegieMidget’s Adoring Angela Lansbury Blogathon which will take place 15-17 February. Brief Synopsis – After defending a suspected murderer, her lawyer discovers the truth and tries to find a way to make things right. My Take on it – This is a film that I chose to watch for this blogathon solely based on the film’s title which intrigued me. The premise of the film is actually quite interesting and despite the plot raising a few question marks along the way about how things will play out realistically, I found things quite thrilling and compelling throughout. Loved the way that the story builds up the story in a very intelligent and effective way that e get a clear picture of everything that is going on with these characters and their motivations. Raymond Burr is great in the lead largely due to the fact that his performance is done in a subtle fashion that allows us to believe his character and all that he is feeling and thinking throughout his conflict of conscience. Angela Landsbury is also great here as the female protagonist because she creates a very leveled character who seems easy to think her actions will be predictable yet things move in varying directions in order to keep things surprising from start to finish. The story is presented quite well on a whole and they find a way to keep things intriguing throughout as we get some nice twists and turns along the way even though this is mostly all told in flashback. Bottom Line – Very interesting premise that I wasn’t sure would work but it does a great job giving us a compelling and thrilling ride. Burr is great in the lead especially since he gives a powerful yet subtle performance. Landsbury is also great in this film because she is able to portray such a leveled character that one suspects that her actions will be predictable yet we keep getting surprised. This story works quite well overall and they find a way to keep things intriguing throughout even if the story is mostly told in flashback. Recommended! 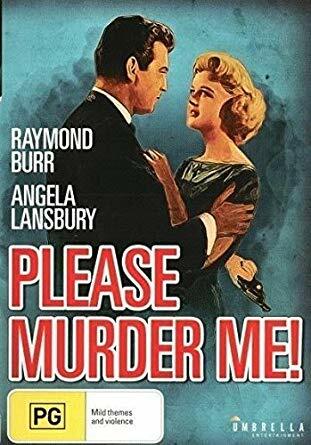 I stumbled on this movie while doing a search on Raymond Burr for something I was planning on writing. I watched it and found it to be very good. I enjoyed Burr and Lansbury in their roles! The title peaked my interest and the fact that Burr and Lansbury were in it, I just had to watch it. I recommend it as well! Thanks for this entry for the blogathon, and hope you can join me for my next one. It does sound an interesting film title.. The actors and director do so much with such an obvious lack of budget. Such a kick to see Perry Mason and J.B. Fletcher together. If only Burr had done a guest spot or Murder, She Wrote then I would have been in Heaven.